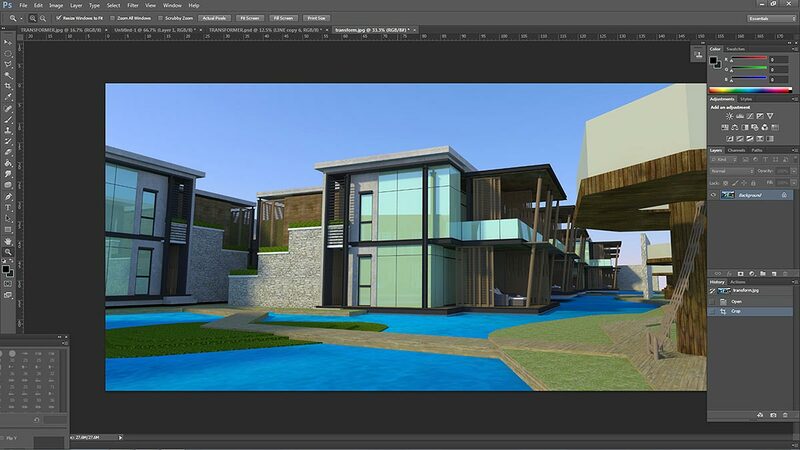 Render a – The building as a whole, and set the window setting to reflective ( I used Kerkythea as my preferred renderer). Render b – Render the building once again, but this time you need to hide the windows (no glass), making it look transparent so you can see the furniture inside. 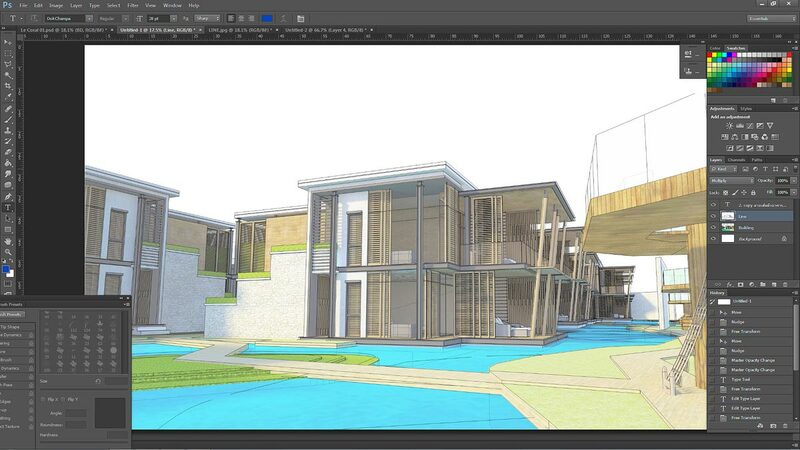 We will also need a SketchUp output image of the Scene in Wireframe. This will only display the edges of the model (for step 3). 2. Remove the sky from both of these files. 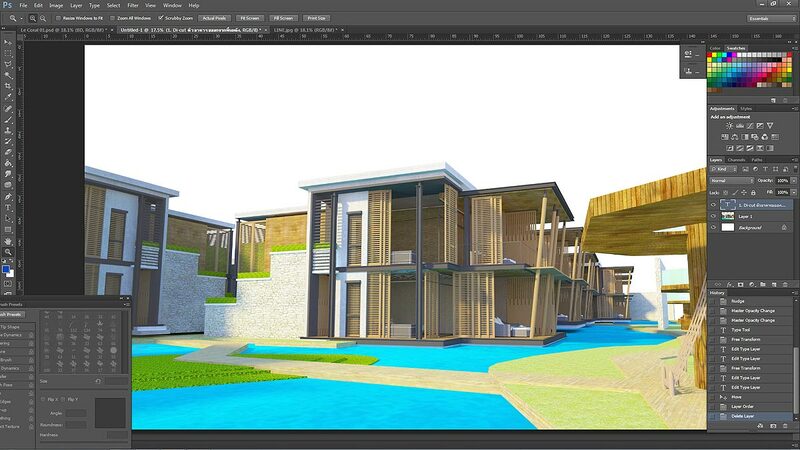 We are going to start with the rendered image without the glass first (Render b). Second Render ‘b’ with no glass. 3. From your saved Scene in SketchUp, export a ‘Wire frame’ image of the building and place it on top of the layer of the building. 4. 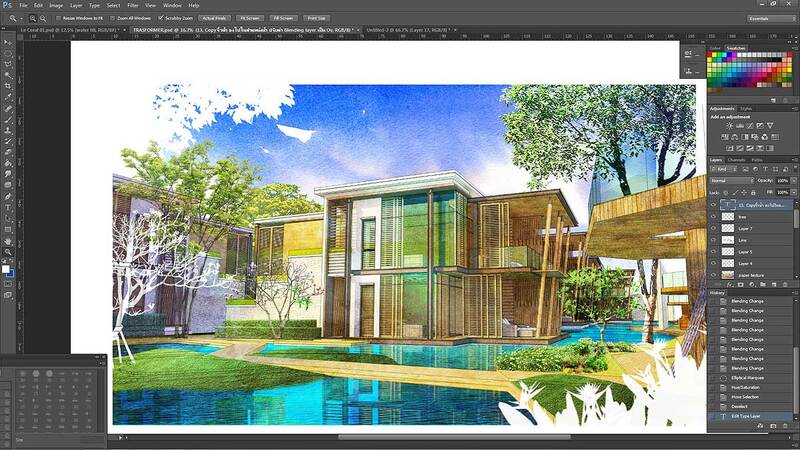 Insert a layer of a watercolor effect/wash on top of the layer of the building and set the blending mode to ‘Overlay’. 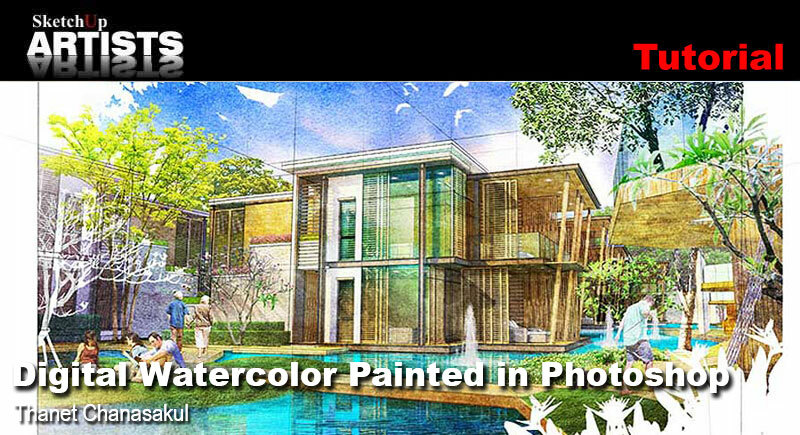 *Note: The watercolor effect can be made by physically painting colors on to a paper and scan it into Photoshop or searching in Google images. Insert a layer of a water color style effect. 5. 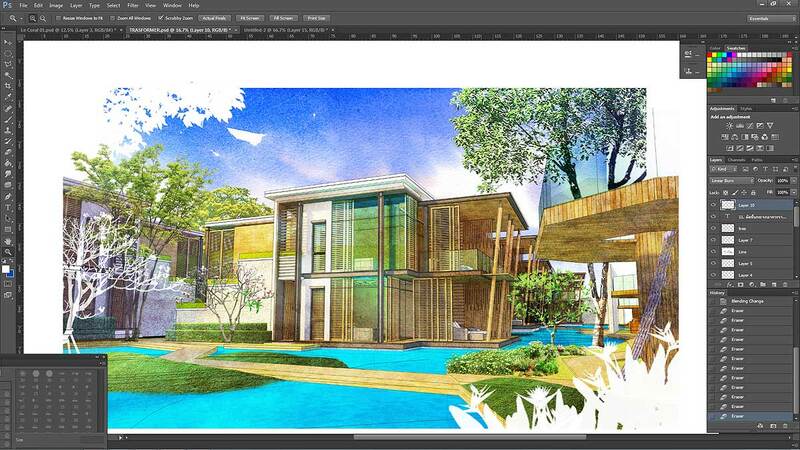 After setting the blending mode to ‘Overlay’, you will see a change and and overall effect on the whole picture. 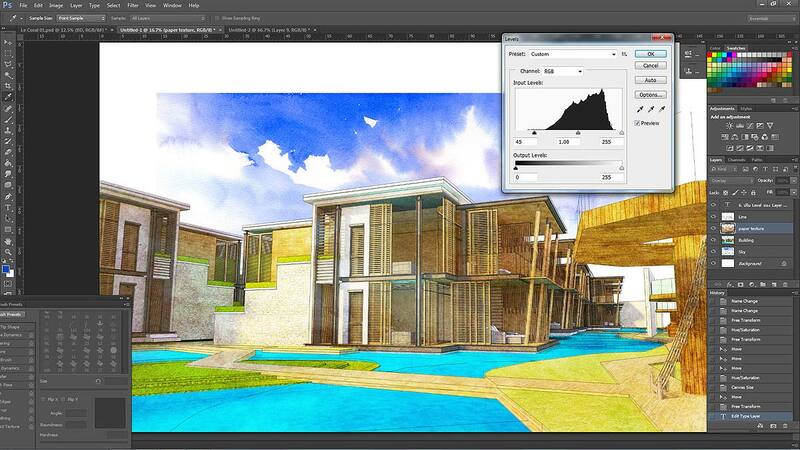 Now you can adjust the color and intensity with the command ‘Hue/Saturation’. Adjust color and intensity with ‘Hue/Saturation’. 6. Insert a picture of a water color sky underneath the layer of the building. Re-size and edit the composition accordingly. 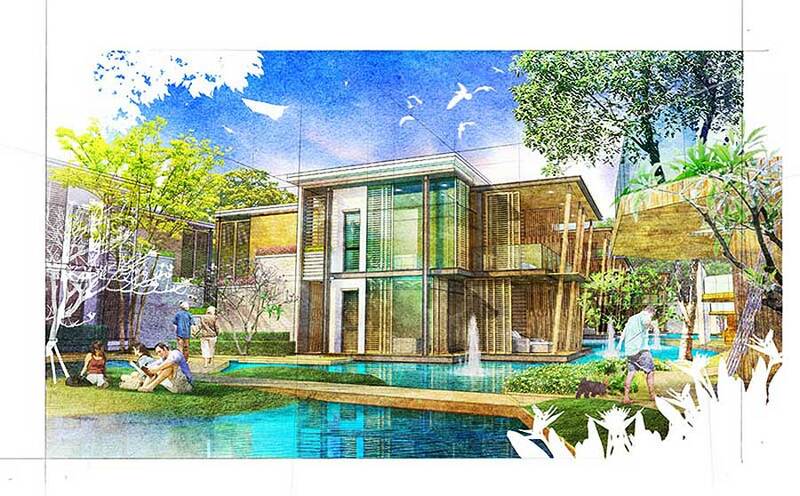 Insert water color sky underneath building layer. 7. 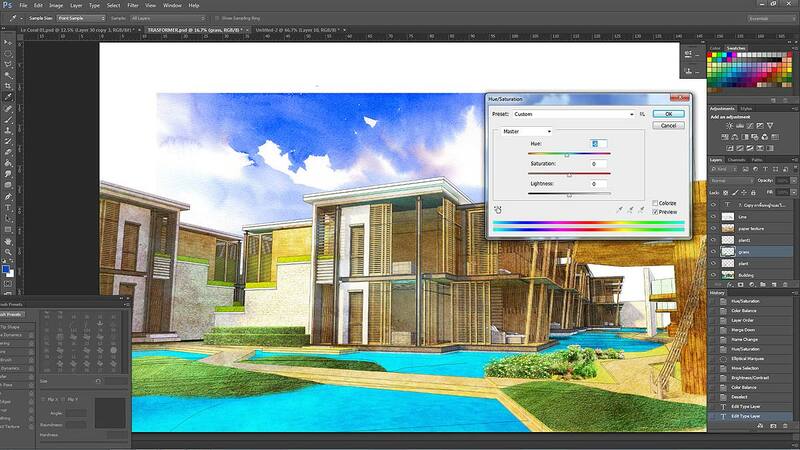 Adjust the colors and tone by using the commands ‘Levels’, ‘Hue/Saturation’, and ‘Color Balance’. Adjust the colors and tone. 8. 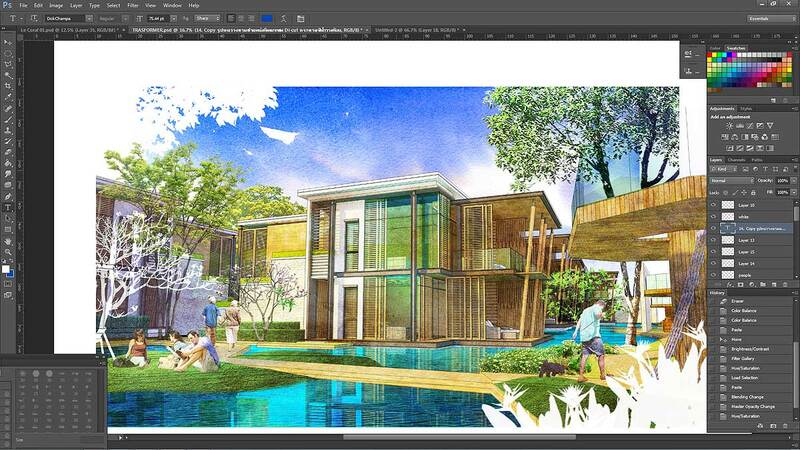 Insert a layer of grasses, bushes, and/or plantations underneath the watercolor layer, and adjust the settings accordingly, by using the commands mentioned above and scale accordingly. 9. 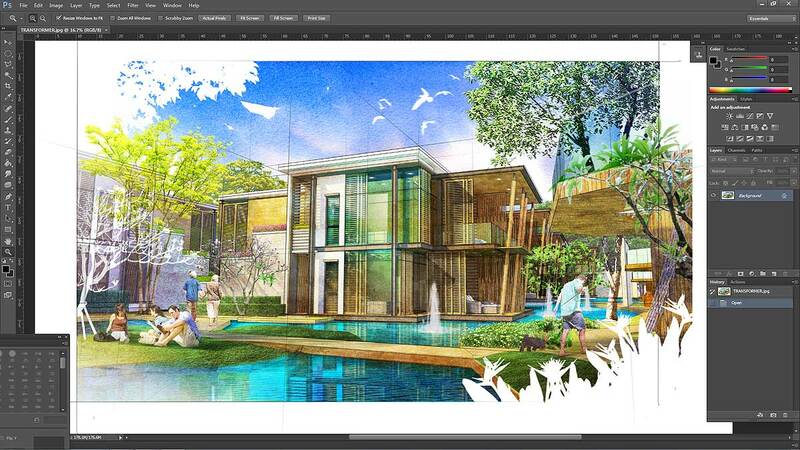 Insert a layer of various types of trees underneath the watercolor layer, edit the composition, and adjust the settings accordingly, by using the commands mentioned above. 10. 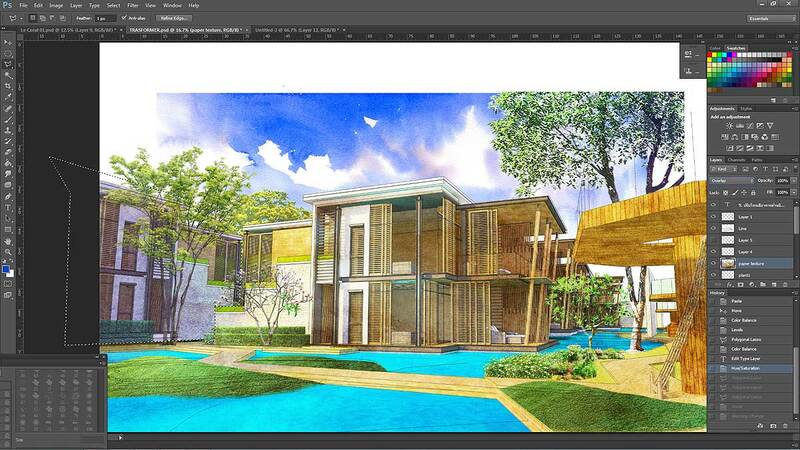 Adjust the tone of the shades and shadows to give a cooler look through the ‘Hue/Saturation’ command. 11. Create a white border around the picture adding plant and tree silhouettes as shown in the picture, through the use of ‘Levels’ command. 12. 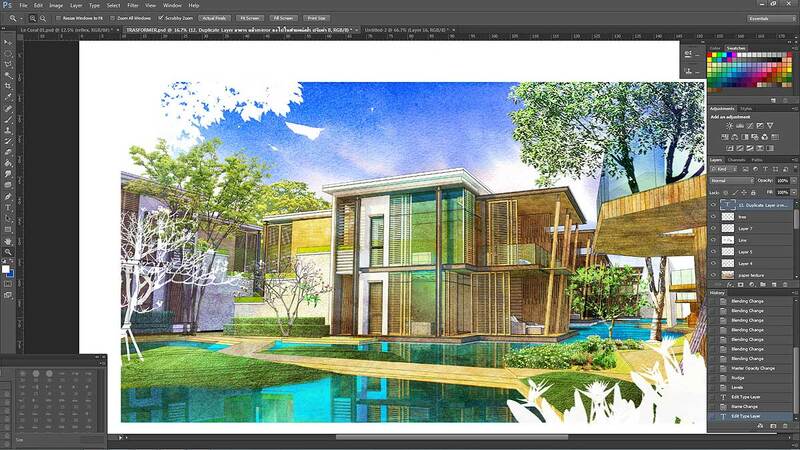 Copy the glass with reflections from Render a image (step 1). 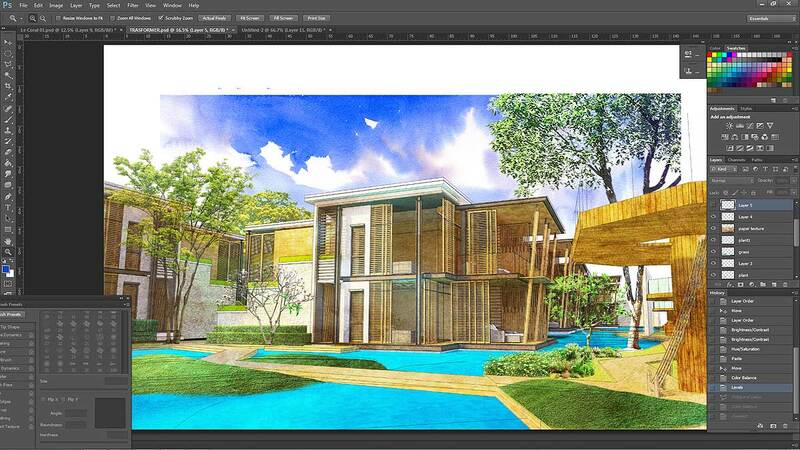 Insert it on top of the layer of the building and then change the blending mode to ‘Overlay’. 13. 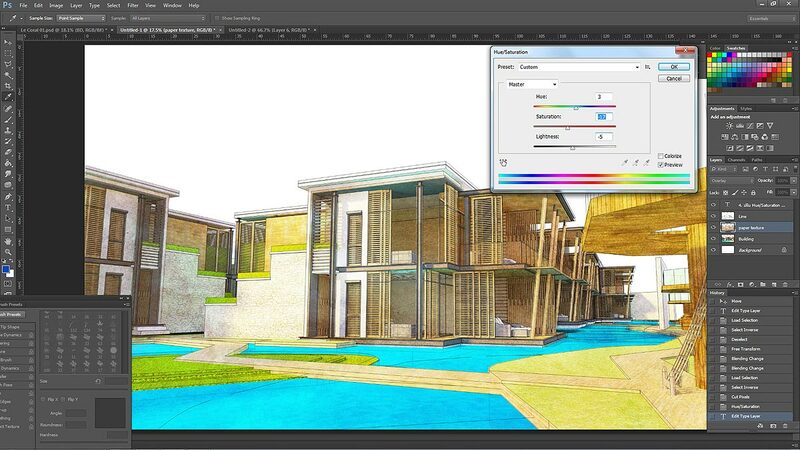 Duplicate the layer of the building and mirrors it onto the surface of the water, and then set the blending mode to ‘Darker Color’. Mirror building onto the surface of the water. 14. Insert a picture of the water surface, which can be found in Google images, onto the water surface in our picture, then change the blending mode to ‘Overlay’. 15. Insert pictures of people and place them accordingly. 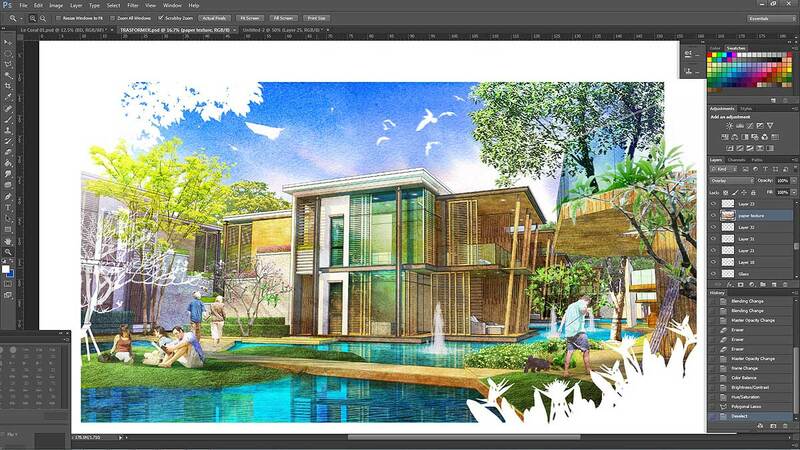 Place another watercolor layer on top of the people once again, and then change the blending mode to ‘Overlay’. 16. Create shadows for the people. Then increase highlights and depth of field to a specific portion of the picture that you want to emphasize, by using the commands mentioned above. I also added a small water feature at this point. 17. Create a ‘sketch’ line by drawing a single black line, then fade out the edges. Copy as many as you want and place them accordingly by using the ‘Transform’ command, as seen in the picture. This will give an effect of a hand drawn illustration to your picture. 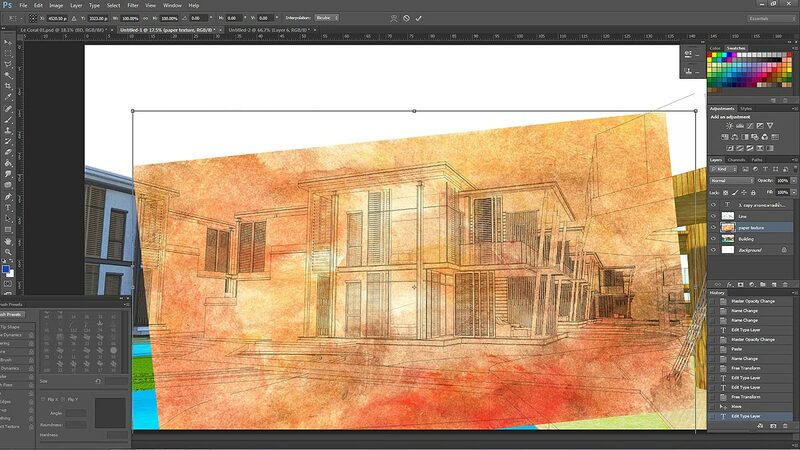 I hope you have enjoyed this insight into my methodology behind creating a digital watercolor from a 3D SketchUp model. Please do remember that, “The more you practice, the better your skills will be and the more you will develop your own techniques”. wooo! It’s so nice. Thank you so much! I really love it! 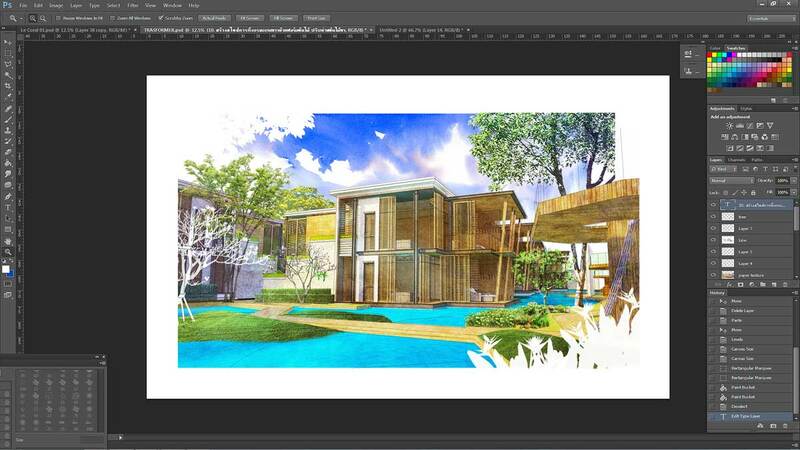 I get many knowledge about photoshop from your tutorial!